Spanish cuisine is a must-order one at this restaurant. The truth is that you will really enjoy good salo, venison and amuse bouches. Try tasty brioches, yogurt and petit fours. The wine list is diverse, it can satisfy the needs of all guests. Azurmendi has delicious cortado, white tea or lemonade among its drinks. Most users indicate that the staff is well-trained. Fabulous service is something visitors agree upon here. This place offers you fair prices for appetizing meals. The divine decor and nice ambiance let clients feel relaxed here. It's a three-star Michelin restaurant that is worth a special journey. 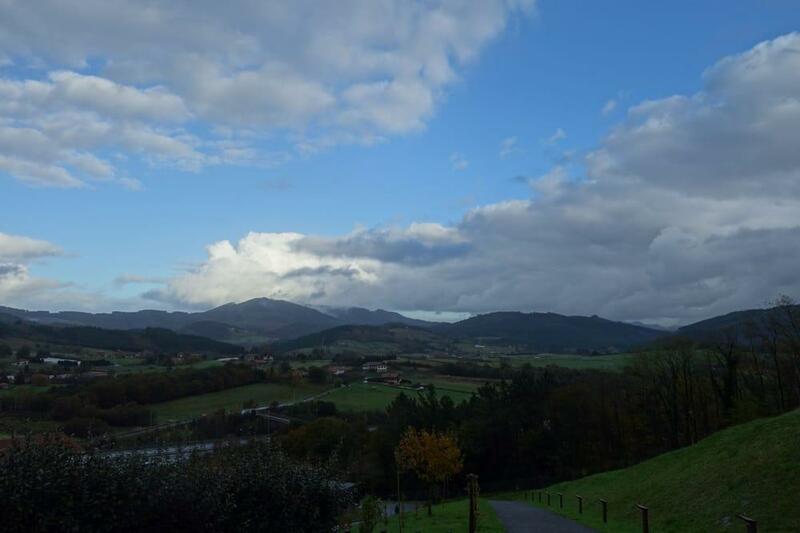 "Amazing scenery good service, food is superb!" Garlic mushrooms are my personal favorite. 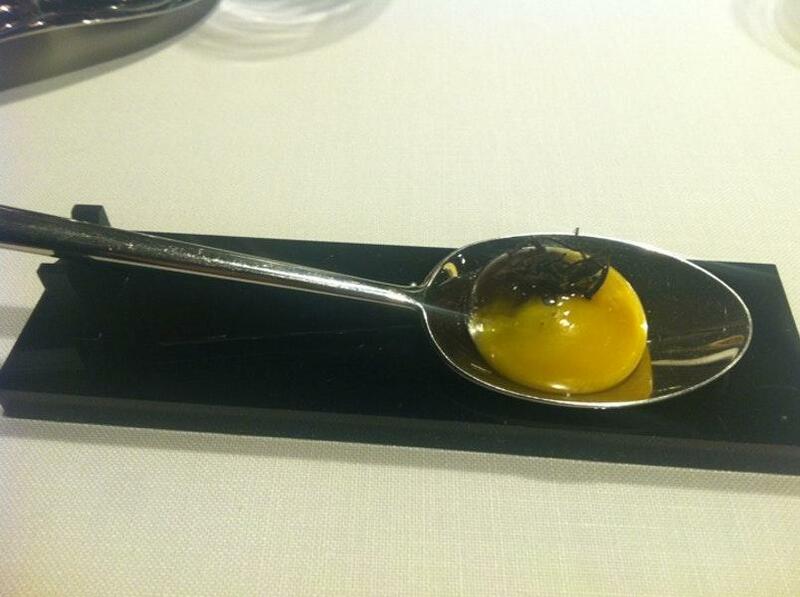 Our meal at Azurmendi was more than just a meal, it was an amazing gastronomic experience. 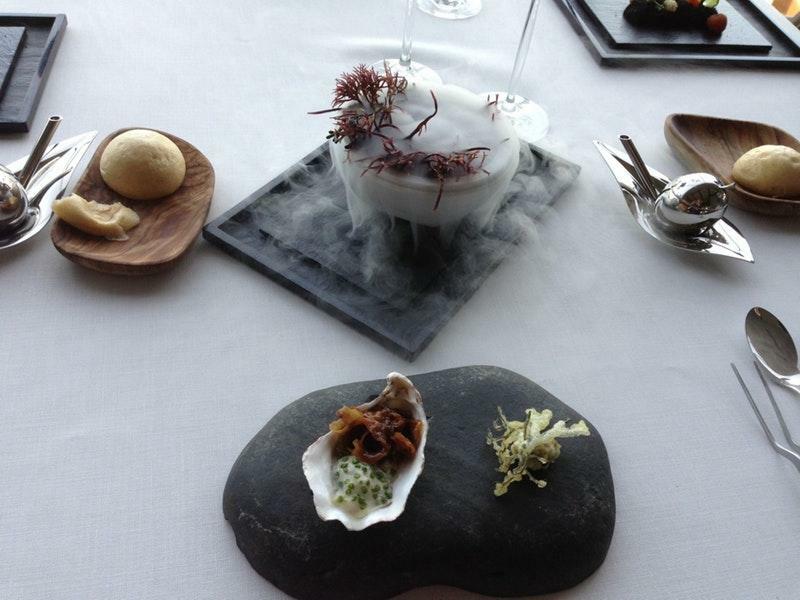 This three-Michelin star restaurant offers an exhilarating adventure for the senses. This was the first of three 3-Michelin star restaurants that we would visit while on our trip in northern Spain and it definitely left a mark on our souls and memories. The restaurant, located atop a hill in a city just outside Bilbao, is a stand-alone glass wall building with a garden on the upper level of the building where they grow most of their ingredients and it's surrounded by vegetation and grapevines. We recommend going for lunch as you get to enjoy the sunlight and amazing views from the restaurant. The experience starts at the indoor garden right as you enter the restaurant, where you're offered a glass of sparkling wine and a picnic basket with four amouse bouche items to taste. It's difficult to remember what all of the items on the menu were, but from this basket my favorite was the tiny brioche sandwiches with smoked fish. My husband really like the hibiscus drink, also part of the picnic basket. After the picnic we were taken into the kitchen where we were greeted by the staff and where we were served a perfectly cooked egg yolk prepared right in front of us, cooked by stuffing it with a truffle oil mixture and eaten in one bite. The experience then took us to one last stop before being seated at our table, their greenhouse, where we tasted several one bite sized items, most of which I cannot remember in detail, but all were delicious. For our main meal we chose the Adarrak menu which is supposed to be more of a seasonal ingredients menu and it consisted of 9 dishes which included txangurro (crab), oyster, gamba (shrimp), lobster, red mullet, pigeon and pork. All of the dishes were beautifully crafted and presented, some were more flavorful than others. My favorites by far were the lobster, served with a coffee foam (it was like butter) and the red mullet served three ways. We chose to do the drink pairing which we absolutely recommend, as this enhances the flavors of the dishes and you'll be tasting some old wines and some pretty interesting sake that you won't get anywhere else. The desserts on this menu were light and refreshing, but not my favorite part of the meal. The chocolate with olive dessert was for sure the better one from the three that were served. After the dessert, they bring a box to the table with all of their petit fours for you to choose from. It's definitely an indulgence, but why not try several items to close this unforgettable meal with a bang! The service was on point, super attentive without being too tense, stiff or too serious. We never felt rushed through our meal, which lasted approximately 4 hours! It's definitely a food lover's experience worth having. Absolutely a brilliant lunch! We took the ‘new’ menu with new combinations. Especially the unique wine paring with the amazing food made it an unforgettable experience.